Happy holidays, readers! We’ll be on hiatus until January 6, 2015. Check back then for a new post—and have a very merry winter break! Occasionally, those of us who revere the Bard speak of his works as if they are some sort of holy text. These plays contain such incredible and untouchable genius that it’s sometimes hard not to treat them with awe. The danger is that once we start to look at a work of literature as something to be revered we cease to see it as something over which we can take ownership. It is too awe inspiring, and what right have we, peons of the modern educational system, to touch such perfection? The answer is, of course, that we have every right, and that teaching our students to revere these plays as paintings in a museum, to be seen and not touched, is to put up a wall between inquiring young minds and the very real and lively nature of these plays. Instead, we need to give students the tools to take these words into their hearts and their minds and truly embrace them. 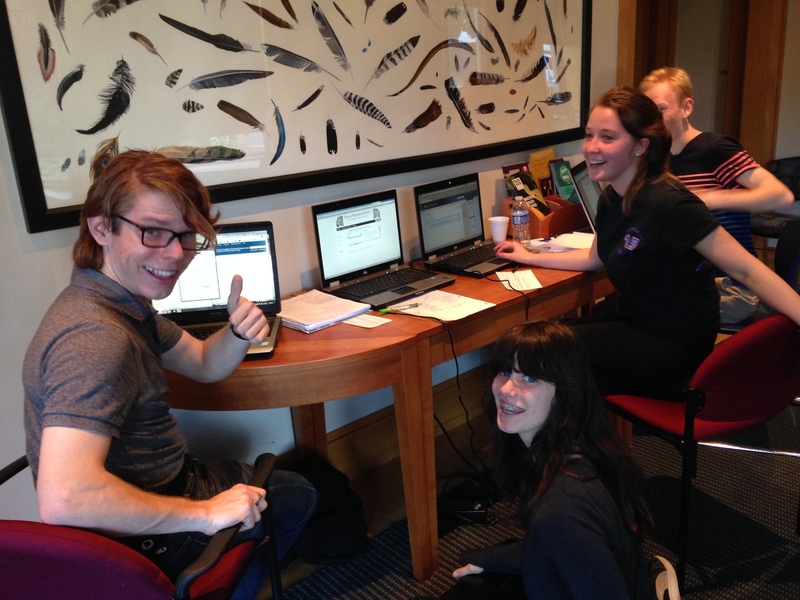 Our competitive antedaters use new web tools to find the true origins of words attributed to Shakespeare. Since September, local high schoolers gathered here every Monday to take on big questions and deep learning around Shakespeare and the humanities. They saw productions of King Lear and Julius Caesar and performed their own cutting of Twelfth Night. And they conducted original research in the Folger collection. It was a blast, and they were fabulous! Folger Education was once again a major player at the National Council of Teachers of English conference in November. Since the conference was held just outside Washington, DC, the Folger Shakespeare Library was able to have our largest presence there in years. The lucky group of teachers who attended a Thursday afternoon session at the Folger were gushing over what they saw: a close look at some of the rarest books in the Folger collection including a First Folio, copies of both the first and second Quarto editions of Romeo and Juliet, and a copy of Chaucer’s Canterbury Tales. They also told us that they were thrilled to speak some Shakespeare lines on the stage of the Folger Theater. 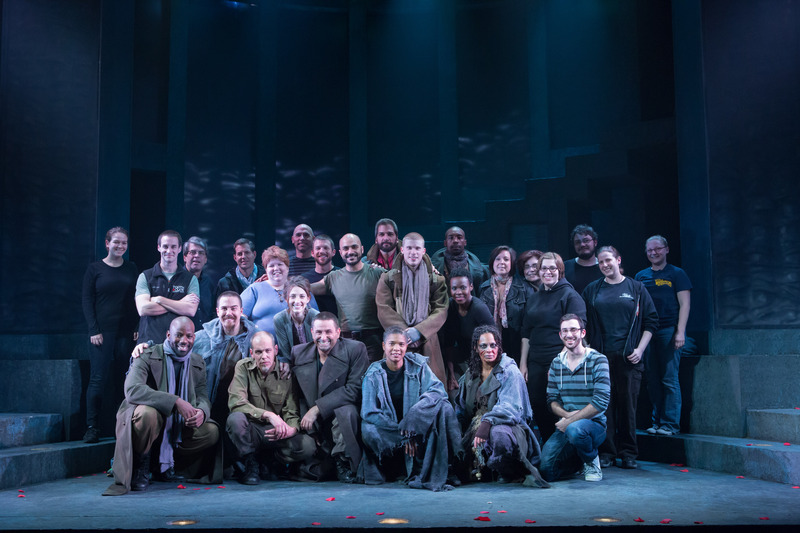 Many of the 70 teachers who came to the Friday evening performance of Julius Caesar at the Folger said that it was the highlight of the conference. One said he was “really blown away” by the play and loved recognizing the pop culture lines like “the fault is in our stars,” though what Shakespeare wrote was “The fault, dear Brutus, is not in our stars, but in ourselves.” Those attending were also treated to an enlightening chat with the cast after the play. We love actor Louis Butelli’s posts for the Folger Theatre Production Diary. Recently, he wrote about his discovery—after a long run here playing Cassius in Julius Caesar (closing Sun, Dec 7)—that whether Shakespeare’s set a play in Elsinore or Agincourt or Rome he can’t resist talking about the theater. Enjoy this player’s perspective. Louis Butelli (Cassius), Julius Caesar, directed by Robert Richmond, Folger Theatre, 2014. Photo by Teresa Wood. One of the fascinating things about performing in a long run of a play by William Shakespeare is the way the play continues to unfold over time. Living with such rich and complex language yields new discoveries; I’ve been consistently surprised by Julius Caesar, and how it contains thoughts and notions that I hadn’t remembered about the play. Lately, I’ve been noticing how often Shakespeare calls our attention to the fact that we are players playing at Julius Caesar. Sometimes the references even leap from play to play. It is believed that Hamlet was first performed very soon after Julius Caesar sometime in 1599 or 1600. Shakespeare had a company of actors for whom he wrote, and with whom he sometimes performed. Hamlet: My lord, you played once i’ the university, you say? Polonius: That did I, my lord; and was accounted a good actor. Hamlet: What did you enact? 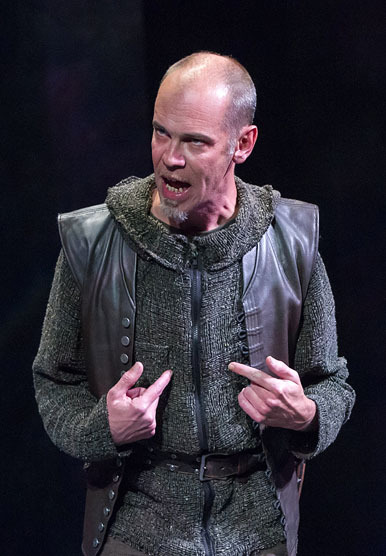 Polonius: I did enact Julius Caesar: I was killed i’ the Capitol; Brutus killed me. Hamlet: It was a brute part of him to kill so capital a calf there. This love for his own craft and his fellow poets and players, this exuberance and joy in storytelling, this warm embrace of audiences are part and parcel of working on the plays of William Shakespeare. His delight in the art form is passed directly on to us, both the artists presenting the plays, and the audiences that come to experience them. Born and raised on Long Island, New York, Louis has spent the past eighteen years working as an actor, teacher, director, and writer. From 1998-2008, he was Artist-In-Residence and Company Clown for the Aquila Theatre Company. During that time, he played in over 25 productions of the works of William Shakespeare and other classical playwrights, appearing Off-Broadway, at major regional houses, on tour in the US to 49 states and across Europe; taught over 300 masterclasses; wrote, adapted and appeared in a new production of Stevenson’s Dr. Jekyll & Mr. Hyde; and authored numerous successfully funded grants. Other credits include Folger Theatre; La Jolla Playhouse; American Repertory Theater; South Coast Rep; LA Shakespeare Festival; Shakespeare Theatre Co, DC; Alabama Shakespeare Festival; Yale Rep; Long Wharf; Orlando Shakes; Pasadena Playhouse; Two River Theater, NJ; Alpine Theater Project, MT; La Scala Opera’s West Side Story in Milan, Beirut, Nagoya, Fukuoka, Osaka, and Tokyo; many others. TV: The Knick (Cinemax), The Unusuals, and All My Children (ABC), Law & Order, and L&O: Criminal Intent (NBC). Louis is co-founder and Executive Director of Psittacus Productions, for whom he has produced A Tale Told By An Idiot (LA Weekly Theater Award) which performs again in May, 2015 for Lincoln Center Education, and CYCLOPS: A Rock Opera (NYMF Award for Excellence, 3 LA Weekly Award Noms, Pulitzer Prize Juror Nom) which has played Pasadena Playhouse, Ars Nova’s ANT Fest, and a sold-out and extended run at the 2011 New York Musical Theatre Festival. Previously, he has collaborated with director Robert Richmond to make the short film, Dreadful Sorry, financed by a generous grant from the South Carolina Film Commission, Twelfth Night and Henry VIII at the Folger Theatre in the nation’s capital, for both of which he was nominated for the Helen Hayes Award for Outstanding Supporting Performer, winning the Award for Henry VIII. He is honored every day he is able to go to work in the service of a great story. I don’t think I just speak for myself when I say that Shakespeare makes all the more sense when it is performed as opposed to it being examined from text. After all, Shakespeare wrote plays, not novels. Shakespeare wanted actors to play out his work on the stage in a way that communicated a powerful message that is relevant to the present state of the human condition. I think that a lot of us – teachers and students alike – forget that. Sifting through lexicons, examining centuries-old texts, and trying to understand Early Modern England, we as human beings lose sight of the relevance that Shakespeare has on other areas of history, and even our present. That’s what Folger Theatre’s production of Julius Caesar helped me realize. The production of Julius Caesar at the Folger carried excellent thematic detail. The show began when actors dressed in ragged, hooded cloaks walked out on stage. These wraiths (very fitting considering Halloween was only about a week and a half ago) spoke in haunting whispers about the Ides of March, foreshadowing what was to come in the play. The whole picture gave me goose-bumps and it was all the more frightening as the red glow from the soothsayer’s bowl illuminated the stage. 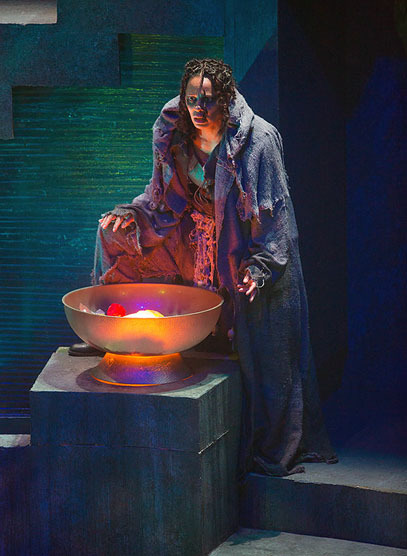 Nafeesa Monroe (Soothsayer), Julius Caesar, directed by Robert Richmond, Folger Theatre, 2014. Photo by Teresa Wood. The first half of the play was pretty consistent with incorporating these wraiths throughout that portion of the performance. The second half took an interesting turn when the ensemble seemed to switch out the wraith cloaks for soldier’s attire. The uniforms looked like they could’ve been from around the WWI or WWII eras. I thought the switch from the leather bound medieval garb of the first half to the trench-coat, gas mask-wearing, rifle bearing look of the second half was a peculiar choice, but talking to the actors after the performance allowed me to understand why that decision had been made. 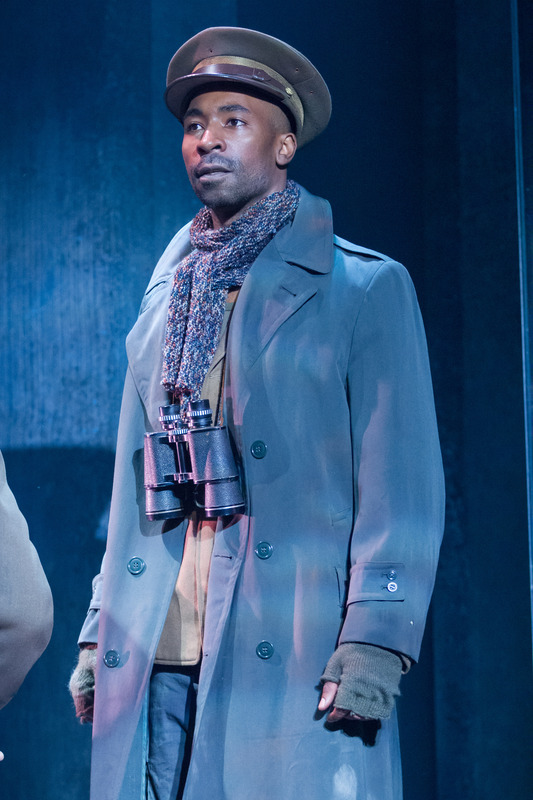 JaBen Early (Octavius Caesar), Julius Caesar, director by Robert Richmond, Folger Theatre, 2014. Photo by Teresa Wood. 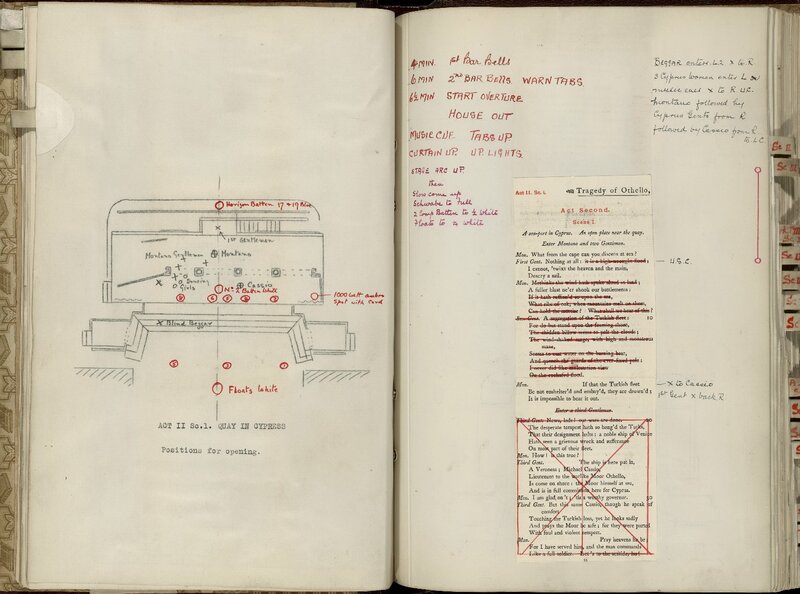 As it happens, British director Robert Richmond was inspired by the WWI memorial in England, and as it is the 100th anniversary of that conflict, he borrowed themes from the memorial and incorporated them into his rendition of the play. The actor Michael Sharon (who played the title role) expressed that much of what Caesar’s death was about involved fighting to sustain the freedom of the Roman Republic, whereas WWI had a lot to with protecting the freedom of nations like Great Britain from the imperialism of countries such as Germany. I thought it was brilliant to put Julius Caesar in a context that was modern and relatable to the contemporary audience. Michael Sharon (Julius Caesar), Julius Caesar, directed by Robert Richmond, Folger Theatre, 2014. Photo by Teresa Wood. We often lose sight of the fact that Shakespeare wrote plays that utilized what the theater had to offer for that time period specifically. His plays are in no way limited by new conceptualizations. If anything, they’re enhanced. I often find that Shakespeare is performed at its best when interpreted in new formats. We can try to decipher as meticulously as possible whatever we can about how Shakespeare’s plays were performed back in the late 16th and early 17th centuries. It’s something that is important to grasp, that’s for sure. Continuing the conversation about Shakespeare as a living piece of theater is not only an exciting mission for any educator, but must be something they constantly try to achieve, not just for themselves, but for their students. 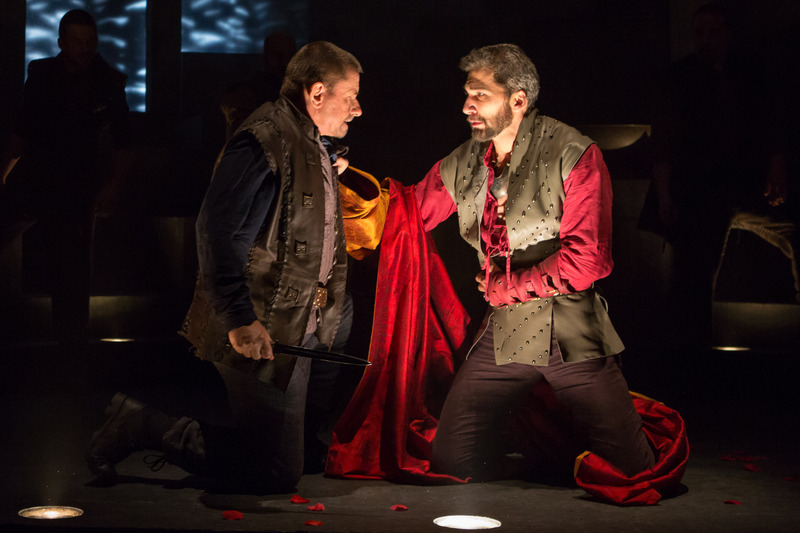 Folger Theatre’s production of Julius Caesar performs through December 7, 2014. Learn more at www.folger.edu/theatre. 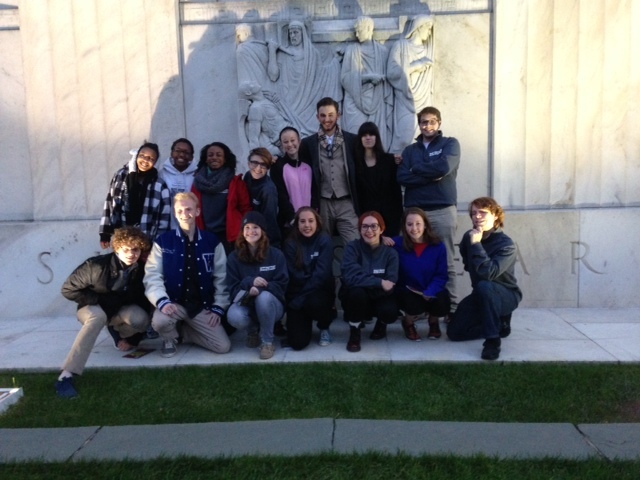 Learn more about Folger Education’s High School Fellows program.